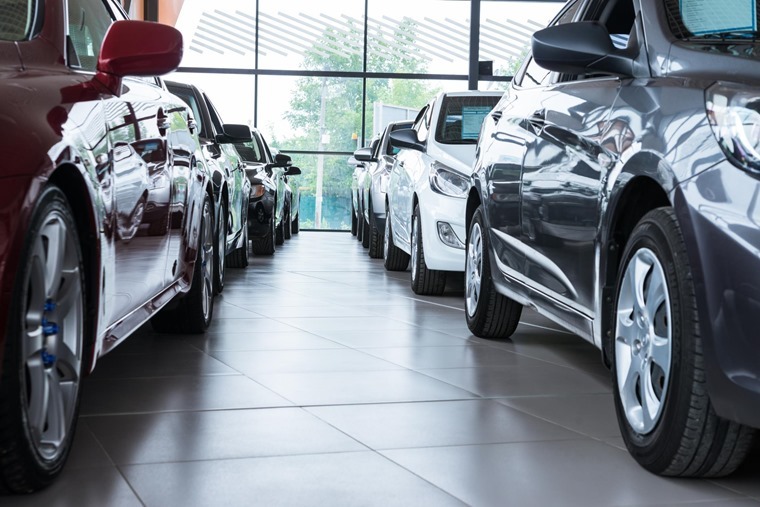 The UK’s new car market grew 1.2% year-on-year in July, thanks to large fleet registrations, an increased “feel-good factor” and some fantastic new car deals, according to the the Society of Motor Manufacturers and Traders (SMMT). 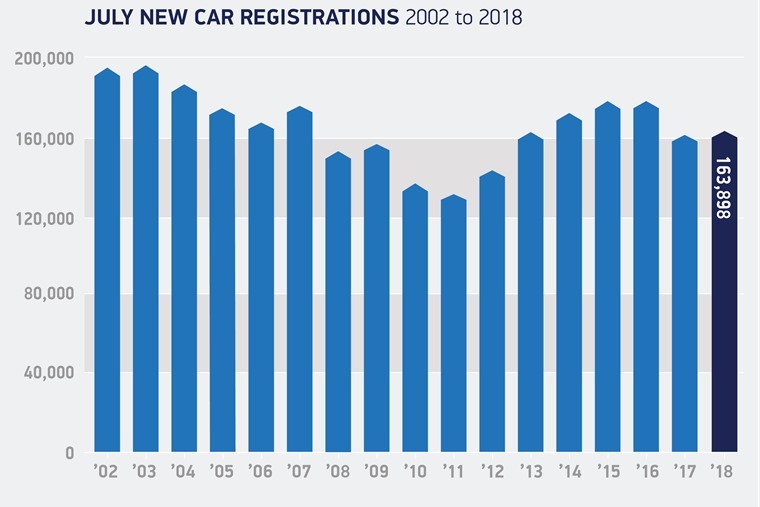 163,898 cars were registered last month, as the market stabilised following a turbulent first half in 2018. The growth was largely down to larger fleets, which grew by 2.6%. Demand from private buyers was also up by 0.1%, although registrations by businesses with fleets of 25 cars or fewer fell by –10.2%. To date, the market remains down 5.5% year-on-year – in line with the SMMT’s forecast. 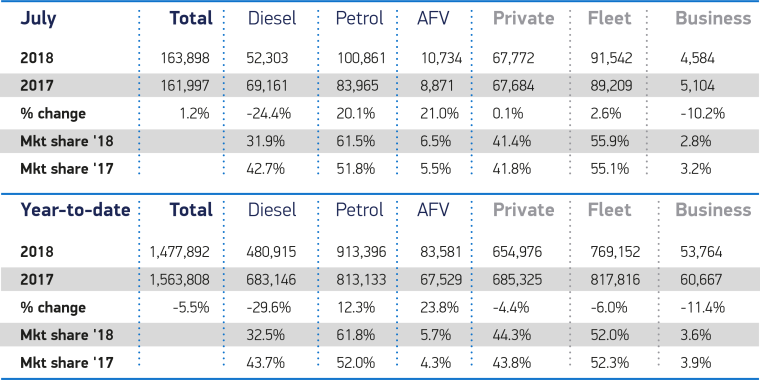 In terms of fuel choice, diesel continues to fall out of favour, with registrations down –24.4%. Demand for petrol cars grew 20.1%, while alternatively fuelled vehicles enjoyed a year-on-year increase of 21%. This gives hybrids and plug-ins a record market share of 6.5%. Commenting on the figures, Mike Hawes, SMMT chief executive, said: “The feel-good factor from a sun and sport-packed July, combined with some fantastic deals on a raft of exciting new models, clearly helped keep showrooms relatively busy last month. “It’s great to see alternatively fuelled vehicles benefiting from this growth, and government’s acknowledgement of the vital role new-tech diesel will play in its Road to Zero strategy should help more even more motorists benefit from the latest, safest and low emission technology over the coming months”. Ashley Barnett, Head of Consultancy at Lex Autolease said: “It’s positive to see a slight uplift in new car registrations, but more clarity is needed to maintain this momentum. Drivers are still reluctant to make significant purchase decisions while there is uncertainty in the marketplace, specifically around the future tax treatment of company cars”. As for the cars themselves, the Ford Fiesta remained the most commonly registered car in July, and is by far the UK’s best-selling vehicle in 2018. The Volkswagen Golf came a close second last month, while the new Polo is clearly making an impact too.